Home » Blogs » silkboard's blog » Lobby for BRT in Bangalore - focus Big10, Circle routes? First things first. If you don't like BRT, think it absolutely can't be done, please keep out, and discuss on other posts. This thread is for those who think that BRT in some sort or form (dedicated corridors, only at some places, or priority signals, or bus only magic boxes, or whatever) is needed for Bangalore, and can possibly be done. We have discussed the subject a lot over past 2 years and have defined BRT as whatever means and ways to prioratize or streamline bus movement over private vehicles. Some Big10 corridors already have Metro or Elevated roads on them, may be starting with the ones that don't have any mass transit plans right on them right now may work better. Old Airport Road, Bellary Road (leave HSRL), Hennur Road, look like candidates. View more presentations from EMBARQ - The WRI Center for Sustainable Transport. G11 via Hennur road to Bagalur & further to the Aero and Logistics industrial parks coming up around the airport & G3 from MG road to Sarjapur will be a good candidates. Both these do not duplicate any other mass transit lines and also serve a good catchment. G3 can only be dedicated from Jakkasandra onwards and can share the big circle BRTS corridor for some distance. So effectively the corridor will be from ORR to sarjapur. G11 is heavily dependent on the BBMP widening plan of Hennur road proposed earlier from Coles park to Bagalur, I guess G10 route, Tannery road is already underway. Anybody from those regions can confirm? One of the problems with implementing BRT on roads in Bangalore, is the difficulty in dedicating a lane just for buses, particularly in corridors like the G3 route where a bus may pass by possibly only once in 5 minutes. Even in the ORR between Silkboard and Hebbal, the frequency of buses is not higher than 1 bus every minute or so. Under such a condition, dedicating a lane just for buses will lead to protests from other type of road users. I have thought of an alternate solution and that is to provide a bus priority lane instead of a bus only lane. We will also need to use some amount of technology to enforce the discipline. Basically a lane will be marked as a bus priority lane with suitable markings on the road say every 100 meters. Other vehicles can also use this lane temporarily as long as they don’t have a bus immediately following them. As soon as a bus reaches behind them, the other vehicles are expected to switch to the other lane so that the bus can move forward unhindered. At the end of the day, the recordings can be taken offline and analyzed to see whether people are intentionally blocking the lane. And in assistance with the traffic authorities, a ticket can be mailed to the vehicle owner. If the vehicle owner wants to contest a ticket, he can appear before a traffic judge who will view the evidence and pronounce a judgment. Once the word goes about people getting tickets, the lanes will be cleared automatically on seeing a bus in the rear view mirror. People will then tend to keep it clear and will use it only for passing other vehicles. After that we won’t even need to equip all the buses with this equipment. The chance of getting caught will be a good enough deterrent. With the availability of cheap CCD video cameras and solid state storage, such equipment can easily be constructed for around Rs. 10,000. Even if the low volumes are considered, it should not cost more than Rs 25,000. In the simplest case, the bus conductor can even use a mobile phone to capture the video on a mobile phone if he happens to be at the front of the bus. As I said earlier, the video need not be taken in each case. The chance of getting a ticket could itself be a deterrent if the fines are high enough. Fine, but hindrance to movement along moving lanes is not a major cause for delays. Delays to PT are caused mostly because of frequent intersections with traffic signal lights & traffic pile ups at such junctions - the real problem lies here & unless these are addressed, the benefits with priority lanes along free stretches will remain minimal. That can be addressed by reserving one lane at junctions as bus-only lanes. Or about one hundred meters (enough for about 5 buses) of the bus priority lanes in all directions from each junction can be marked as bus-only sections. Sensors can be installed at the intersections to sense the presence of buses on these lanes and give priority green signals when buses are present. Enforcement of the bus only lane can be done using the camera system that I had suggested earlier. BRT can be done in NICE Road, additional to as shown in map. They need to build bus stops in junctions: Hosur road, BG road, Kanakpura road, link road, mysore road, magadi road and Tumkur road (7 stations). Big 10 buses will serve as feeder buses for these stations, and NICE link road BIG 11 bus need to be started. They are already making ORR double flyovers keeping future BRT in mind - which will support Big-Circle buses. But K1, K2 and K3 roads are not wide enough for BRT. IDS, Old Airport Road + single lane BRT? There is no big plan as of now for Old Airport Road - that would be a candidate. NICE road etc, please save for later. BRT on expressways are questionable (because Buses can anyway move fast, plus people don't live on expressways), please. Avoid general discussions (which could be endless) and keep to the feasibility of BRT on some of the Big10 / Circle routes. At least when talking up a concrete project to take a BRT demand report to BBMP/BDA/BMTC, make best efforts to back a running horse instead of fresh ideation. Chances would be a lot lot better. Moving to technicalities - are there any parallels in the world for "part-BRT", as in small tricks and provisions to speed up the buses as opposed to through and through elevated or at-grade-dedicated bus corridor? Center lane for buses. This single "track" becomes the road divider of sorts. Two "tracks" at places where there is some width available. These are the "stations". Magic boxes at few signals to let the bus "tracks" through. The "track" would be used by "express" services, which will have fewer "stops". Use regular mixed-traffic buses to go a bit back or front to your local bus stop. Sort of like Railway's super-fast trains vs regular passenger trains. Buses should go in the wrong side in BRT Lanes !! To have a common bus shelter, which is called as Bus Stations with automated ticket system in most of the systems, BRT special buses should have door opening on the right side (driver side). It becomes a problem in case if we have the same bus running in non-BRT routes as well which will be the case here in Bangalore. To overcome this problem, buses should go in the wrong side, i.e. Right Side instead of usual left side. We should have an X at the beginning and end of the BRT lanes with special signal cycles. For example, in our case we should have X in Silkboard and Hebbal. To utilize the BRT lanes to the best possible way,we need to have faster buses . Volvo Buses are Bangalorean's Favourite. We saw Benz Buses and Marcopolo Buses too but were not much attracted. It is very early to comment on Benz but Marcopolo has not been very good in performance. Some Marcopolos that I took such as 201RC were competent and was on par with 201R volvo on a free road with minimum cabin noise too. But have not seen consistent performance.Power of Volvo is amazing with good initial pickup, engine refinement and top speeds. In long BRT corridors such as Silkboard to Hebbal, we need to have buses with engine specs similar to that of Volvo bring the power of around 275 hp both for A/C and non-A/C to avoid the blocking. In many of shorter spans BRT lanes, it is unavoidable since replacing so many buses may not be practical. It is better to be moving slowly in the bus lane than getting struck in the traffic. Roads like 50 Feet Road in Hanumanthnagar, Few of the Bazaar Streets of Jayanagar (of course they do not get jammed as of now, keeping future traffic in mind), Sampige Road of Malleshwaram are all good candidates. Let us list out few more..
Only problem might be in Junctions where new Signal cycles needs to be added for them. Can't we take out parking of cars on the Brigade Road and have a Bus Lane like above image connecting the upcoming Metro Station near Plaza and having HOHO service around this area covering MG Road, Brigade Road, Residency Road, Vittal Mallya Road if possible with just 4/5 buses with flat rate,not with Volvos like earlier which proved costly. This is going all over the place now. Paucity of time to moderate but please try to apply all concepts to Big10/Big circle only first. Try to arrive at traffic figures (may need talking to BMTC). Look at road widths can come up with segment wise strategies. Also keep in mind train mass transit which may exist/planned on some of these routes when picking the correct Big 10/Big circle route. BRT on big-10 just to prove concept? I understand that you want to piggy-back the BRT on big-10 since its already in motion (big-10). Is the idea also that once it gets off the ground on big-10, big-circle etc it can then be implemented elsewhere too? Is the idea also that once it gets off the ground on big-10, big-circle etc it can then be implemented elsewhere too? Dont want to think too far. 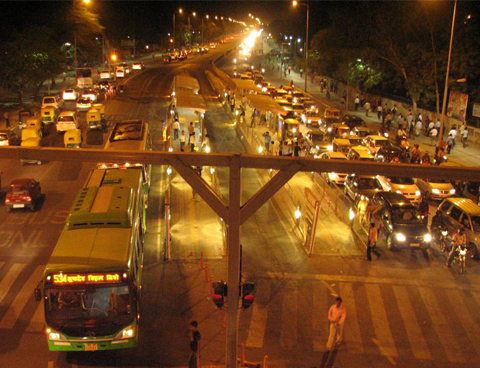 The concept of BRTS is already proven in other cities. To get focus - meeting/test-ride on G3 or G1 route? To get some seriousness into BRT lobbying (@Vasanth - sorry, but please keep the gyaan safe for now, will use once we get into details, plenty BRT gyaan is around on old threads here - the project requires gyaan specific to the routes so that we get started first. Lets pick Big10 for 2 reasons. there is no point in arguing over best routes, nobody will win, we will only lose time. Lets try prove the feasibility of the concept on a few routes. While doing that, (through more details and data) we may always learn that some routes are better than others. Can always extend to other routes and ideas later, but must get a lobbying project off the blocks. Lack of focussed and summarized lobbying/demand is one reason why BRT has not happened yet. So lets just do something first. Anyone disagreeing with above, please start your separate project and collect people there. This is an open place. IDS and myself are on. More people wanting to join the "Lobby for BRT" project with focus on some Big10 or Circle routes, raise your hands please. We will kick this off with a test ride aka meeting on G3 or G1 or a Circle route (TBD). @ids - you and i know its been proved elsewhere. the reason i asked ther question is this - at the BRT meeting/session here some months back, folks from CEPT and Latin America felt that rather than a pilot BRT a BRT on a bigger scale (like ahmedabad) would work best and a smaller scale one might not really get the sort of benefits which we think it should , and then this can be used to attack the BRT. It is from that perspective that i asked if the plan you guys have is to first demionstarte on big-10 and then extend this plan to the rest of bangalore. @silkboard - im not sure abt joining for the project, but i would like to come and join when you go for the test ride and explore. Indeed, and thats why we need to pick direction based routes which can be extended on corridors on both ends. The Big circle is already a known candidate, we need to pick one cross city Big 10 which can connect the big circle BRTS and Metro/mono/CRS. So the challenge is to ensure they complement the train based mass transits already planned and not compete with it. The reason we should stop calling BRT implementations as POC is because the C is already P'd. All implementations are now implementations full & proper. Bangalore internal road are small expect for some one ways. The outer ring can be thought of but there also only few roads are big rest are small. How can we implement in partial locations the BRT project. The road to Airport can be used on trial basis I guess. Big 10 leading north, south, east and west there is no need of BRT(namely G5, G6, G7, G8, G12), as metro will serve that audience, and ORR BRT will serve as feeder to metro. The routes G4 and G10 for BRT becomes unnecessary if IIMB-nagawara line of Metro Phase 2 is started. I also think inner-ring-road BRT is not required as metro underground north-south and east-west route will serve that target audience. So in the above mentioned 4 out of Big 10 routes and inner-ring-road routes, normal bus service is enough, no need of BRT. So BRT and Metro should complement and serve as feeder to each other. ORR has limited width in silkboard to mysore road, and widening of that is opposed overwhelmingly, so we can have BRT on rest of the ring road as Phase I. It would be helpful to know what is the Peak capacity of BRTS. Based on that, we can determine which of the routes to pick. For, we should not pick up a corridor where the PCU is either too high or will be in the near future. Also, I believe BRTS ,done the right way ,is a better bet than Mono-rail[ Dont think there carrying capacity to be too different].So, best thing is too look at Mono rail routes proposed by Schomi. How can we implement in partial locations the BRT project. What is the meaning of partial? BRTS is one way of priority, contraflow is another way of priority, plain old markings are also some form of priority. The purpose of giving priority can be achieved in many ways. So in the above mentioned 4 out of Big 10 routes and inner-ring-road routes, normal bus service is enough, no need of BRT. Please mark on a map all routes (BRT+metro) you are mentioning and explain with some statistics so everybody understands. That is not on the agenda. We are looking at Big 10+circle only for now to evaluate how ridership on these routes can be increased/made faster/effective using priority techniques. G1) Old Airport Rd -- Monorail X'ing (Domlur Flyover), Commuter Rail X'ing (Marathalli Bridge), also Signal Free Rd project. G2) Hosur Rd -- Proposed Metro Ph.2 + Elevated Tollway (4 lanes). G4) Bannerghatta Rd -- Proposed Metro Ph.2, also Signal Free Rd project. G7) Magadi Rd -- Proposed Monorail (CTTP /Govt), also Signal Free Rd project. Assuming that all planned proposed projects come through, would BRT be necessary at all ?! It is unlikely that all projects will materialize. For example, the signal-free road projects are a question mark & planning BRT instead would certainly make better sense. Deeper question: Does a bus travelling on a corridor like Big 10, signal free or otherwise, need a priority? What are the benefits of a corridor bus route getting some form of priority? How far should we go to give bus a priority? Should we go as far as widening roads so bus can get priority? Old Airport Rd - Good for BRT i/o "signal-free"
G1 (Old Airport Rd): From St.Patricks, Brigade Rd -- To ITPB (Future Metro stn), appx 19.7km (Via MG Rd, Trinity metro stn, ASC Centre, Domlur, HAL, Marathalli, Kundalahalli, Brookefields, EPIP, Whitefield TTMC). a) 4.5m uni-directional bus only underpasses (i/o 2 lane, 7.5m) at Hosmat hospital jn, ASC centre jn, Command hospital jn & Namjoshi rd. b) 7.5m bi-directional bus only underpasses (i/o 4 lane, 15.0m) at Manipal hospital jn, Wind tunnel rd jn & Suranjandas rd jn. c) At Lower Agaram rd jn, the proposed all-traffic underpass /flyovers may be built as planned & will not effect bus movement as the jn will become signal free for all traffic. d) At Domlur bus stand, a 2-lane, 7.5m bi-directional flyover can be built (i/o 4-lane 15.0m flyover). e) At Kundalahalli gate, a 4.5m uni-directional bus only overpass would be required (i/o 4 lane, 15.0m underpass) for buses headed towards city from ITPB. To facilitate safe /unhindered entry & exit of buses from underpasses /overpasses, barricades over a short length would be necessary both ways. Misuse can be prevented with sensors fitted on buses that open boom barriers at entry. 1) Mekhri circle to Byappanahalli, via Jayamahal rd, Cantt stn, St.John's Church rd, OMR. 2) RM Guttahalli to Yelahanka on Bellary rd. I think several people are thinking BRT as in through and through dedicated bus lanes. Does not have to be! As IDS says, answer the basic question first. Do we feel that we need to speed up the Buses? Can we do that by giving them priority? What would the different ways to give them priority? The idea is to attack the point #1 here, using whatever means possible. Through and through dedicate lanes not possible? Ok, so what. Think of those select few points where you can prioritize the bus (like Naveen has in a comment above). Think of hat one magic box or bus lane flyover that will give buses that extra 10 minute boost. Things like that. Don't think 6 lane roads, with 2 side or center lanes for Buses. that thinking is going to invite a "no not possible", and then you have an uphill battle. Just get together and design a unique bus speed-up solution for Bangalore. -- Can have dedicated lanes from Mekhri circle upto Cantt stn, after which it can only be provided with under /over passes at signal intersections instead of the ones planned to make the corridor signal free (upto Hopefarm). Will interface with Commuter rail, Metro Ph.2 inbetween & also at Byappanahalli. -- Can use two of the six lanes on the elevated road coming up between Hebbal & Yelahanka. Will hook up with Monorail, Commter rail & HSRL at Hebbal. Also, with BRT above at Mekhri circle. a) Widening roads over very long distances for two additional bus lanes (abt 25ft or 7.5m) would cause a lot of disruption, not to mention the costs of land acquisition, even if all owners agree to give up part of their land. b) Creating priorities for buses along a Big-10 or any other route with "open" ends (ie. if left unconnected to other mass transit/s at terminals, or inbetween) would result in marked reduction in patronage as will shortening the route (this is generally true for all forms of tranport). c) Assuming that buses move at an average 30km/hr, a 20km route would take abt 40 minutes whereas with current levels of peak hour congestion, it would take about 60-70 minutes or more. Thus, there can be substantial benefits by way of savings in travel time. d) Bus schedules will become much more predictable /reliable. Prove Big 10 are unconnected or are open ended or cannot be made connected with slight route changes.In fact some Big 10 can be increased in length if priority can be ensured. Possible to even suggest slight alterations in Big 10/circle routes to make priority work. Look at elevated on stretches as well. I dont want to get into how we CANT retrofit priority on existing routes. Instead we have to look at how we CAN make slight alterations to make the routes priority and more effective. "New TTMC's (12) will come up at intersection of each Big10 road with Outer Ring Road, and include fully segregated pedestrian movement at all junctions. BDA is beginning survey work"
Naveen - noted your points abt Old Airport Road. Let us detail priority ideas for this route in a separate dedicated post. From DNA today - "The Palike's plan is to have a broad stretch from MG Road to Ring Road beyond Banaswadi. Wheeler Road follows Kamaraj Road on this route." Hi SB, IDS, I posted the above pictures on just to get general idea how we could go about rather than being too conceptual. I am sorry for diverting putting Briagade area stretch, I felt that there is a strong need for Bus Priority on these busy CBD areas acting as feeder and HOHO to Metro just like how it is done in London. I will put it in another post about the feasibility. This is a low hanging fruit as you can clearly make from pictures. Coming to the Airport Road, since there is road width problem, can we utilize parallel roads wherever possible to divert some amount of traffic to offload some of the volume and have a priority lane. This flashed in mind since most of the yellow board cab drivers, while coming from Marathalli towards City, take right turn at HAL Junction and come till command hospital junction via CMH Road and other Indiranagar roads. Also, few of the cab drivers going towards Koramangala IRR instead of taking the Domlur Junction, take a diversion towards left immediately after Marathalli, pass through EGL (any badge if we show for EGL security irrespective of company exists or not, they allow inside! and used effectively by cab drivers while escorting employees). If the road via CMH can be improved and a new full fledged road can be built to link Marathalli directly to Koramangala IRR, volume on the airport road decreases enabling us to justify one lane should be good enough for private traffic and one can be used as bus priority lane. There can be argument that if the volume is less, why do we need BRT. These are the possibilities that could be used. Hebbal TTMC working is important for Airport road volvos. I think TTMCs should be built on both side of the road so that buses need not cross road everytime to enter TTMC. New blog created with possible routes: click here. Can bus compete with car? View more presentations from Paul Barter. Hey Vasanth, no problem. this is building up well. we will all dig deep once we get to a project to write concrete demand report. Info for those following this discussion - A project has been created, do come over if you want to help write a solid demand report. See: Bus Priority System - pilot Old Airport Road/G1. this will save 20 mins for all buses. for ksrtc buses time not so important, so should be excluded from brt lanes. Big10 has become Big Trunk. New name, new branding, but journey times on the routes have reduced even more. Trip on G1 all the way now takes twice as much time compared to when the route was started. Isn't it time to give these green buses some priority!? Instead of a separate BRTS/BPS program, can perhaps ask for Big Trunk program itself to include these elements. Very hard thing to get going as any such thing involves BMTC, BBMP, and Traffic Police at a minimum. Before buses are introduced in a big way as Big Trunk, we should channelize with Ashwin Mahesh, who is working with BMTC on Big Trunk routes. BRT special buses should be procured to those Big 10 roads where Metro will not be operational such as Sarjapur Road, Magadi Road etc. The city's planners are making an attempt to prioritise public transport and also bring about a semblance of lane discipline on Bengaluru's chaotic roads. After trying and failing to enforce autorickshaw lanes, they are now planning to give BMTC buses a dedicated lane. The Directorate of Urban Land Transport (DULT) will pilot a BMTC bus lane on the Old Airport Road, starting from Trinity Circle to Hope Farm junction in the IT hub of Whitefield. This is in response to the BMTC seeking dedicated lanes for its buses on 12 roads. From a reading of the article, the plan appears to be only for a 'priority lane', and not a dedicated lane, and well, I'd say "thank God for that". My reasoning is explained by one look at the pictures accessible here. As such, I wouldn't recommend BRTS even for our Big-10 routes, or even the outer ring road. Perhaps, the Peripheral Ring Road could incorporate that; but, then again, would it be more economical compared say an elevated METRO line, considering the huge real estate costs involved? The Bus Priority Lane scheme is understood to be working well in the city of London. But, that's largely because they have the "Transport for London", which is a regulatory authority that oversees the functioning of all the players involved. An equivalent of that, the BMLTA (Bangalore Metropolitan Land Transport Authority), was instituted in the city almost a decade back. But, it was never adequately empowered, and consequently, we now have the BMTC, Transport Dept, DULT, Traffic Police, Metro, Commuter Rail (when it happens), etc etc, all working in their own silos. In such a scenario, there's little hope that the Bus Priority Lane is going to go too far. Now, the purpose of all of these one would think is to make people switch to use of public transport. When that can be achieved more effectively, and at no cost to the government (meaning tax payer), through facilitation of bus services aggregation, a user experience of which is detailed here, can the government be obstructing it, just because it could affect BMTC's revenues? Is BMTC's revenues more important or overall public interest? That's a question that has been elaborated more on, here. Half hearted attempt like done in New Delhi would only be resulting in failure of such a system. Priority lane will never work in India since there is no lane driving at all in India. We need a segregated lane seperated by a divider. London and Bangalore are on the opposite sides w.r.t. traffic enforcement with thousands of cctv cameras monitoring bus lanes in london, number plate detection and fining. I don't think this will be successful and this is an anti publicity exercise for BRTS, which is not a BRTS. Are you okay giving priority to buses on Bengaluru roads? Meeting with BMTC MD on Bus Priority, confirmed!